Hi there, I'm Kumi Matsukawa, a correspondent Tokyo, I work as a freelance illustrator and instructor of watercolor and pastel classes near my place. I'll be in Spain with one friend from Japan and another from Russia. Unfortunately those two girls are not able to attend the symposium ( unlike me) but we'll make the most of this sketch opportunity, exploring Each and every moment, location, occasion.. We'll arrive Barcelona on 8th and after symposium days, we are planning to visit Seville, and Madrid.. This is my second symposium. I first attended the first one.Here you can see my then posts. http://pdx2010.urbansketchers.org/2010/08/my-results-from-urban-color-session.html http://pdx2010.urbansketchers.org/2010/08/my-results-from-urban-line-session.html http://pdx2010.urbansketchers.org/2010/11/three-months-have-past.html I've been preparing my bags, tools, and things to bring and put them in the suitcase, then re arranged things again and again.. Still feeling unrealistic.. Am I going there in two weeks??? Hi Kumi - so glad that you are coming this year and look forward to seeing and sketching with you again... you know how much I love your work! Hi Liz, thanks! 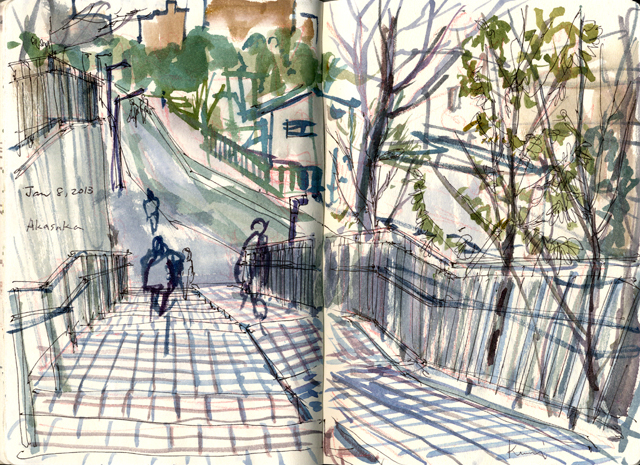 I too looking forward to sketching together with you again :-)) Hast luego! It'll be great to sketch with you again. See you soon! 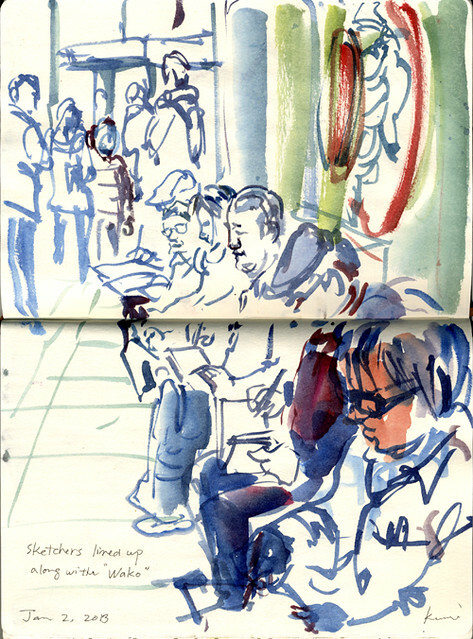 Hi Richard and Shiho, see you and sketch together again soon! Looking forward to seeing you -and your sketches!- for real! Thanks for introducing yourself Kumi and sharing your previous posts. They were so interesting to read, and got me even more excited about Barcelona. I have been following your sketches - lovely. I leave in just over a week and ready to go now ! Looking forward to finally meeting you IRL, Kumi, see you in Bcn! Hi Miguel, looking forward to seeing you in Capellades on the 9th! Alissa, glad you enjoy the previous posts :-) Hope we have chance to sketch together. Nina, yes, finally :-) see you soon! Kumi, this will be my 2nd symposium, too. It will be nice to see you again in Barcelona. I hope we can meet in BCN. Regards! Vicky, I hope we take same class :-) See you soon! Aurora, Thank you for your advice! Look forward to meeting you! It'll be great seeing you again! I'm going with my wife and our friend (both non sketchers) and so far they planned on seeing Girona and Granada during our sessions. I hope to do some sightseeing after the symposium too. 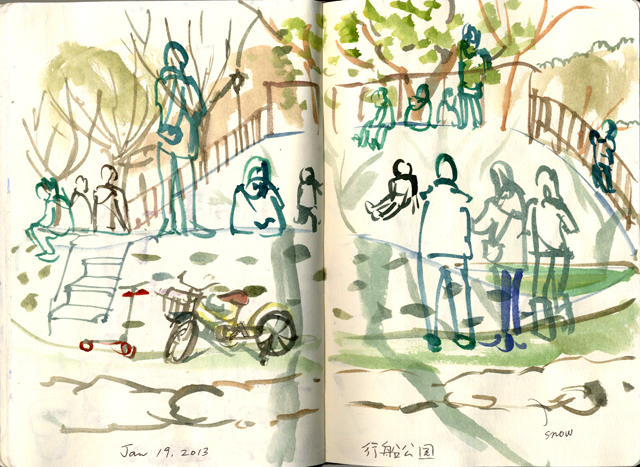 hi Kumi, it'll be great meeting you and sketching with you together! Hi Mike, see you again soon! Marina, I 'm looking forward to meeting you! Kumi, can't wait to see you again! Hi Elizabeth, see you again, soon! I look forward to meeting you, Kumi! Hi James, sure, see you soon!